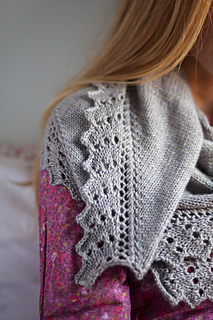 This shallow triangular stockinette shawl is finished with a lovely deep lace edge. 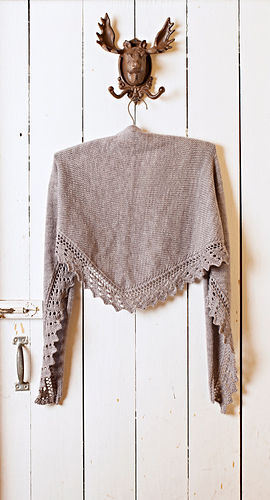 Shown knit with two skeins of Plucky Cashmere sport, it is feminine and simple, light and airy. But, this pattern works equally well when knit with several other Plucky bases, such as Oxford or Crew! It is also a perfect recipe to mix up bases; hold them double and knit until you run out of yarn. Chance of Flurries is the perfect way to dress up a plaid shirt, top a girly shirt or to toss over the shoulders of your little black dress.